In January of 2015 VetRocket proudly sponsored the Earth to Sky Calculus (a group of high school science enthusiasts from Bishop, CA) 67th balloon launch into the stratosphere in hope of deepening knowledge of the upper atmosphere. BALLOONING INTO THE SUNSET: On Jan. 14th, Spaceweather.com and the students of Earth to Sky Calculus launched a Space Weather Balloon to monitor cosmic rays. Unlike most of their launches, which happen in broad daylight, this one occurred at the end of the day. During the ascent into the stratosphere, the golden rays of the setting sun played across the fabric of the expanding balloon, painting it with all the colors of the sunset before the balloon was finally swallowed by darkness. This was the 68th launch in the group’s space weather ballooning program. The purpose of this particular flight was to measure high-altitude cosmic rays, which have been growing stronger since late Dec. 2014. Cosmic rays are energetic particles accelerated in our direction by active galactic nuclei, distant supernovas, and other sources across the Milky Way. Because these particles pepper Earth from all directions, it does not matter what time of day the Space Weather Balloons take off. Clearly, though, sunset launches have a special beauty. The balloon’s payload, which carried two radiation sensors to the stratosphere, traveled more than 94,000 feet high before the balloon popped (in darkness) and parachuted back to Earth, landing in Death Valley National Park. A recovery team had to hike more than 18 miles to retrieve the payload. A first look at the sensors suggests that excellent radiation data were collected during the flight. Later this week, the team hopes to present a summary of recent measurements, so stay tuned. Hey thanks! This flight was sponsored by the folks at VetRocket, developers of high quality digital radiography products for veterinary applications. Here is their logo en route to the stratosphere. 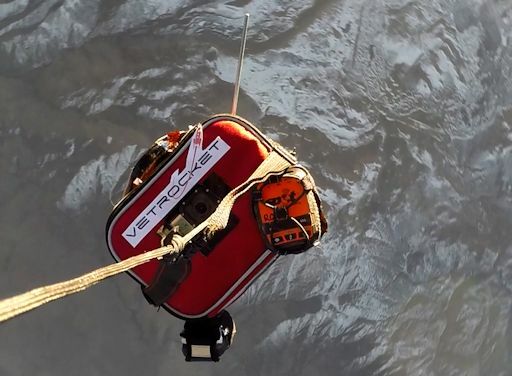 VetRocket’s generous donation of $500 made it possible to buy the helium and other supplies necessary to get our Space Weather Balloon off the ground. Readers, if you would like to sponsor a flight and support the students involved in this research, please contact Dr. Tony Phillips for details.